Or what I like to call…Order out of Chaos. I recently submitted this picture to my writers group, with a short explanation of my “to be discussed” submission (Chapter Three of my next novel Black Flagged). As a joke (a dry one), I told them that if my explanation was confusing, then they should refer to this plot chart, which would clarify things. They got the joke, and everyone that responded, kindly informed me that they couldn’t read the chart, which was my intention…I can’t give away the entire plot that easily. I figured that only someone with a relative or friend working in a CSI lab could turn this into a readable image. They knew that too. Joke’s on me. I often get the question, how do you even start writing a novel? That’s the easy part (or maybe the hardest for some). You take a story idea brewing in your head, and start to craft a scene. Then you start writing. Does it have to be the beginning of the story? No. In my opinion. Once you get to writing, you’ll know soon enough were the scene fits. This is where you start to develop a problem. You really need some form of structure in order to continue. Even if it’s a simple notebook outline. I should come to a SCREECHING HALT at this point. I can feel the heat on the back of my neck. Yes, many writers start with the structure before writing. Characters. Places, Everything. You can buy software to help you craft everything before you write a word, or you can borrow a book that gives you the framework for creating basic story structure. This approach is pretty common. And, I don’t think I’ll ever really do it that way. I like to get the concept of the book formed in my head, and start writing a scene or two…but very soon after, the over-organized, ex-military side of me needs to start working on the details of structure. It really gnaws at me. I scribble a comprehensive outline in my notebook (15-20 pages), leaving room for additional information. I like time lines to be accurate, so I always start a historical time line of events. I start a character info sheet…nothing too fancy (names, basic info, description). I have to stop myself at some point and get back to writing. I love details, so this can become an over-consuming task. 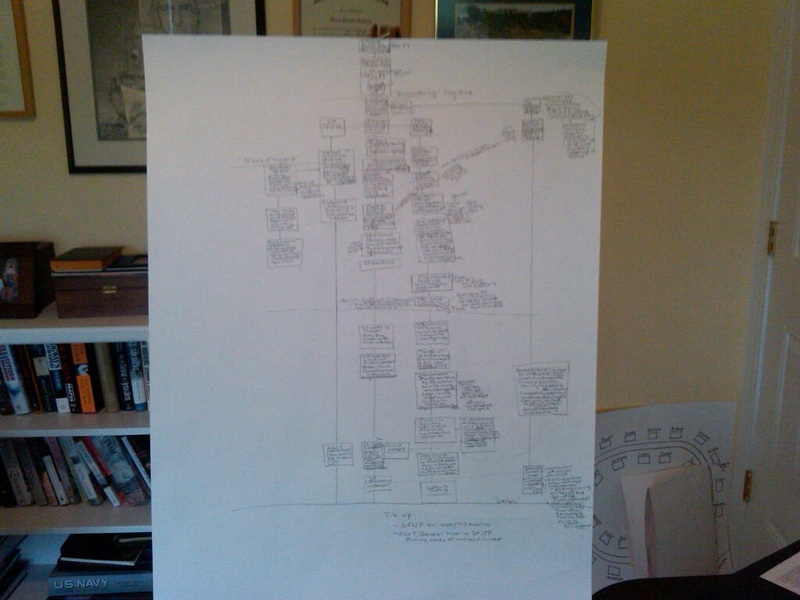 Once the writing flows again, I will turn to something like the Plot Chart once the plot lines start to confuse me. Chapter Five for Black Flagged. Once I started involving multiple government agencies, with their own interests and action…I had to switch from the notebook to a large visual device. I used a similar device for The Jakarta Pandemic, but not for the plot. You’ve already seen my neighborhood map (added to the book at the request of readers), which helped me keep track of over 30-something households in the story. I created this pretty quickly, once I couldn’t visualize who lived next to who on Durham Road. Overall, The Jakarta Pandemic’s plot line was simple. Most of the story took place inside the neighborhood (one house mainly) and stuck to the protagonist’s point of view.Easy…I miss those days. I don’t have this luxury in Black Flagged. I have FBI agents, CIA managers, covert agents, private security contractors/assassins, pentagon officials, rogue generals…and they’re all pursuing their own agendas. I better make a readable copy of this chart ASAP…my daughter has a bad habit of “helping” me by putting her crayola markers to creative use! If you haven’t read the prologue to Black Flagged, check it out HERE: PREVIEW.